Congratulations to Reenita Malhotra Hora, producer of Radio 3's Asian Threads . She's the winner of the Gold Radio Trophy in the category of Current Affairs, for her programme 'The Girl in the Green Dress' at the prestigious New York Festivals International Competition. She's seen here collecting the trophy at a special Gala event in New York City on Monday 17th June. Stay tuned for another chance to hear this award winning documentary on Radio 3, and a new series of Asian Threads coming your way this autumn. Asian Threads is a half hour weekly docu-story series spinning the tales of Asian communities and cultures -- their personal accounts, their history, their literature. Storyteller Reenita Malhotra Hora distills the wisdom of ancient and modern traditions bringing you epic moments woven deep into the fabric of Asia. 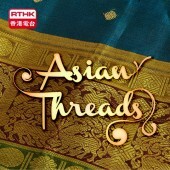 Neither a news show nor a talk show, each episode of Asian Threads is woven around a single theme. Our stories profile interesting people and the things that happen to them. Some are well known personalities, others are regular everyday people. There are funny moments and emotional moments, all feature real scenes with real characters and narrative threads. When we feature fiction, we draw upon stories about what it's like to be here in Asia or as part of the Asian diaspora. Would you like to broadcast your story on Asian Threads? If you hear about something in the news or in your community that you think might make a good docu-story for us, send us an email: asianthreads@rthk.hk. We will contact you if your idea works for a forthcoming show.